« Gilman Overpass: Which Alignment? The 43rd annual Solano Avenue Stroll was a rockin’ and rollin’ success, thanks to our fabulous volunteers! Albany Strollers & Rollers again managed two Bicycle Valet Parking lots for the event, in the lot below Masonic in Albany, and at the top of Solano in the Wells Fargo lot in Berkeley. 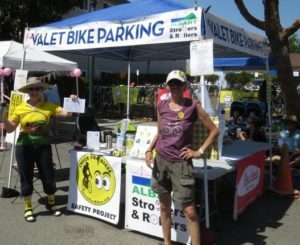 The weather was hot and the cyclists came out in droves – we parked more than 300 bikes in both lots, and our own 18 “Moved By Bikes” Valet Racks were up to the task! Thank you to all our Bicycle Valet Parking volunteers, led by Sylvia Paull, Eli Cochran, Mac McCurdy and rackmeister Ken McCroskey. Barb & Mark Altenberg, Joseph Friedman, Griffin Neal, Shauniece Williams, Samantha Hampton, Mike Gill, Anne Malamud, Eddie Chau, Jane Lenoir, Bryce & Lyell Nesbitt, Tony Caine, Brian Beall, Lai Yuling, Patsy Reese, Stacy Loucks and Maribeth Hutson all helped check in, park and retrieve bikes. We needed every single one of you to make the operation go smoothly! A steady stream of cyclists rolled up the Red Carpet into our west lot all day! 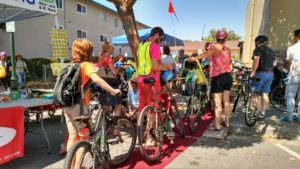 The coolest addition to our BVP service was the Masonic lot’s “Red Carpet,” donated by Janka at Floor Dimensions, which led cyclists up our ramp into our lot – very glamorous! Mike Cabanatuan & Michael Primmer were the absolute kings of the AS&R table setup. 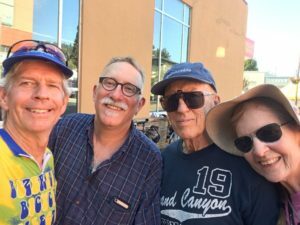 The two of them, Valerie Risk, Kim Van Eyck, Sherie Reineman, Nick Pilch and I (Amy) had a great time engaging people and doing outreach on behalf of AS&R and cycling in general. 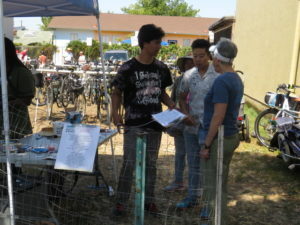 We spoke to so many Stroll-goers of all ages, answered questions about all aspects of bicycles, bicycling & walking, made some great connections to help us facilitate more racks at the Middle School, signed up a handful of new members (welcome! !,) sold a bunch of “Check for Bikes” clings & bumper stickers and one BikeLink bike locker card… and our reflective leg bands were flying off the shelves! If many of the names above sound familiar, they should! Some of our volunteers were veterans who have helped us at previous events and know the ropes. AS&R’s event rookies brought much-needed new energy and were a HUGE help. All were terrific and got major kudos from everyone who came by! A big shout-out to Pat, owner of local businesses Bua Luang Thai Cuisine & Tay Tah Café, for again sponsoring our BVP service and providing delicious lunches & coupons for some volunteers. Pat’s support is so important and we really appreciate the effort she puts into helping us in all our events. Bhimsen of the new restaurant Mountain Mike’s Pizza at the top of Solano provided lunch and coupons to the volunteers at the Wells Fargo lot so we all had plenty of food! We appreciate the continuing support of Pat from Tay Tah and Bua Luang – thanks for the lunches and coupons!! Lucas Euser of ClifBar donated hundreds of Clif Bars, Organic Z Bars and Fruit for all the volunteers and many visitors, too! On a hot day like Sunday, believe me, we all needed the extra energy! Special thanks to Grizzly Peak Cyclists who lent us their two pop-up tents via Sherie, and to Brad & Linda Carlton, who lent us their folding tables. We hope that YOU will be there for #44!